Navigating the world of communal living can be tough, and that is at the best of times. Whether you own a property or are living in one, just managing your living space can be tough – but property maintenance doesn’t have to. Areas such as laundry rooms no longer have to be an issue with a professional Vernon dryer vent cleaning. Routine maintenance can extend the lifespan of your appliances and keep them working just like new for years. Keep clothes dry and tenants happy with a little help from a Gorilla. Major appliances in multi-unit properties are put through the ringer on a daily basis. Dryers in apartment or condominium complexes see dozens of loads every day. This constant use means wear and tear not only on the machine itself but on the ventilation system around it. Dryer vents and ducts collect bits of lint and debris with every load. Bit by bit, this does not seem like a major issue but over time, can lead to fire and health hazards. On its own, a clogged lint trap is a minor fire threat but as the sides of vents become layered in flammable material, this risk increases. Mould and allergens are also known to collect in clogged vents and a lack of airflow prevents appliances from working properly. There is nothing worse than going to collect clothes only to find them damp and in need of another cycle. More than being an inconvenience, this habit is a waste. Don’t spend more time or energy than you need to when you can call a Gorilla instead. Calling in a professional service for your Vernon dryer vent cleaning means more for your property than a cost-effective solution to your debris issue. Choosing a service local to you ensures prompt service, while expert tools and training mean a great result every time. Annual cleaning of your ventilation system extends the lifespan of your appliances as well as saving on resources. 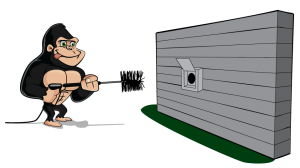 Each Gorilla service is fully insured, so clients can rest easy knowing that vents are being cleaned without the stress and labour on their part. Don’t worry though, you won’t be left out! Before and after photos are a key way to keep clients involved while showing off the great results for our Vernon dryer vent cleaning.